Preorder now on Amazon Kindle! 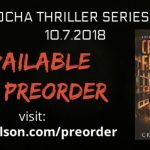 The next installment in an exciting new international crime thriller series is available for preorder. 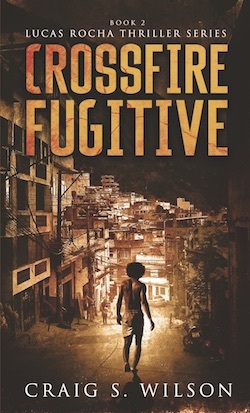 Lucas Rocha’s treacherous journey through the underbelly of the world’s most sensuous city continues with Crossfire Fugitive! Lucas Rocha owes Daniel Burke his life – not that it’s worth much. The military police are hunting him. Rio de Janeiro’s most feared drug lord wants him dead. Lucas is caught in the middle while desperately trying to save his younger sisters, one of whom is critically wounded. Daniel, a DEA agent on leave after a Boston drug bust gone bad, is vacationing in Rio to learn about his birth family. But all he’s uncovered are the grim realities of life in the favelas. Now it’s Lucas’s turn to rescue Daniel. But as a fugitive who’s caught in the crossfire, how can he possibly succeed? 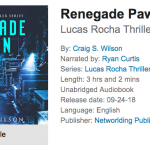 Crime Thriller Audiobook RENEGADE PAWN Released on Audible!